This is definitely the time of year for visitors to Phoenix. I mentioned earlier in the week how much I loathed February when I was growing up in central Illinois-- well, I think a lot of people agree with me because thousands upon thousands of people flock here each winter. And when baseball's spring training starts up at the end of the month? Katie, bar the door! I thought I'd share a photo I took at the Water Ranch last week, primarily because I think most of you would not associate pelicans with the desert. Over 30,000 sandhill cranes alone come here to the desert to spend the winter. Can you imagine how many thousands of other feathered species join them? Yes, the desert in spring can make you believe you're experiencing a little corner of paradise. I've lived here long enough to have seen a few changes. For example, many businesses in Phoenix either closed down during the summer or had abbreviated summer hours. (Like the main branch of the library!) Most of the roadwork was done during the summer in order not to inconvenience winter visitors. With over 5 million people living here, that's all gone out the window. There's no way any business is going to shorten its hours, and as far as roadwork goes, winter visitors are being inconvenienced along with everyone else. (Well... actually, the residents receive the double blessing of roadwork and thousands upon thousands of people on the roads who don't know where they're going.) But any way you look at it, roadwork and tourists are a very small price to pay for living here in February. Oops! I'd better get myself off to the corral. It's gotten very noisy out there. Head 'em up! Mooooooooove 'em out! On the casual sociopathy of the traditional mystery, or... should there be such a thing as a "comfortable" murder mystery? This book lover arranges her huge library of novels into imaginative scenes. How the Chicago Public Library is bringing story time to the laundromat. Arizona's new superintendent took the oath of office on a children's book on inauguration day. When Dell flipped on mystery readers: how a publisher and two legendary bookstores made mysteries into jigsaw puzzles. Here's what we know so far about The Devil in the White City movie adaptation. The disastrous decline in author incomes isn't just Amazon's fault. Why a medieval woman had lapis lazuli hidden in her teeth. Burials suggest that Icelandic Vikings had a thing for stallions. A rare bronze penny sells for more than $200,000 at auction. An Egyptian schoolboy's 1,800-year-old lesson is to go on display. The hunt for the Nazi loot still sitting on library shelves. What llama-poop-eating mites tell us about the rise and fall of the Inca Empire. Days before its authentication, a possible Michelangelo painting disappears from a Belgian church. A very naughty kitty slashed a 17th-century portrait. Bad Padme! A pack of wild dogs in Texas carries the DNA of the nearly extinct red wolf. A Hawaiian snail named George, believed to be the last of his species, has died. A 'bouncing" baby orca has been spotted among the endangered population. An iguana species last documented by Charles Darwin has been reintroduced to a Galápagos island. San Diego's Frozen Zoo offers hope for endangered species around the world. A year later, his Match.com profile pays off for the world's loneliest frog. Scientists are using AI to decode the ultra-sonic language of rodents. In Cloughmills, County Antrim, Northern Ireland, you can see the entire village knitted out of wool. The best twelve cities in the world for book lovers. Once a year, over 27,000 Elvis fans flood Parkes, Australia. From Lady Liberty to Hollywood to the Middle East, these are the most exciting museums opening in 2019. Alice Lee, the statistician who debunked sexist myths about skill size and intelligence. Navajo Code Talker Alfred K. Newman, among the last of the World War II heroes, has died at the age of 94. The top ten Quakers in fiction. Forty books that changed librarians' lives. Twenty words turning 100 in 2019. Twelve thrillers and crime novels CrimeReads is excited to see in 2019. 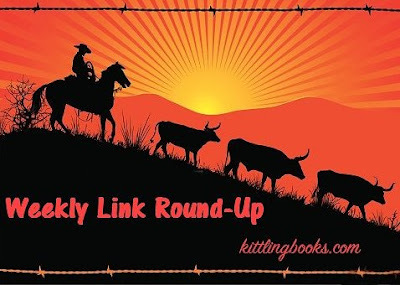 Seven novels that explore America's "oldest swindle" (the crooked land deal). Five books about Native America. Ten stunning photos of the super blood wolf moon lunar eclipse. A state-by-state survey of literary masterpieces (as determined by the most prestigious literary prizes in the country). 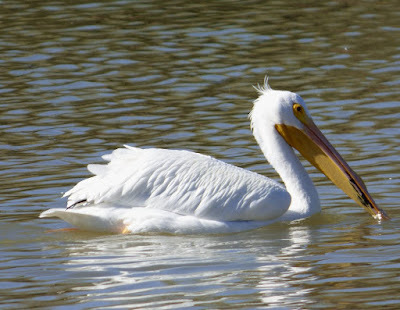 I agree that most people wouldn't think about pelicans in the desert. Are they saying 'where's the fish?'. OK, I'm old - thinking about the whole 'where's the beef' thing. I know you remember that. Ha! And, yes, I've certainly been one of those visitors to Phoenix in February. This year, it won't be me. My daughter is going on a bachelorette (or whatever you want to call it) party next week to Scottsdale. It's amazing how many young women now do these weekend jaunts before their wedding. Daughter told me that it was with a bunch of her nurse co-workers. She said that she'd be the 'old lady' of the bunch, having been married 12 years now. Ha! I told you I was 'old'! I asked her if she'd get to slip away and visit the Poisoned Pen and she said she was trying to figure out a way to do that. There are plenty of fish in the ponds at the Water Ranch, so I imagine those pelicans (there were three) enjoyed their lunch! I always find something interesting to check out! And what I find interesting, especially after our polar vortex week and 75 or so hours below zero, is how many animals and birds stay here! It was about 5 degrees yesterday morning and I watched 3 squirrels running and chasing and junping--you could just see how happy they were to be out again! It's amazing how they can survive, isn't it?